Hello and thank you for the wonderful support you all have blessed me with on the release of the first issue of Creative Miniaturist©! I have received several questions regarding how to view or download the file on the ISSUU.com site. 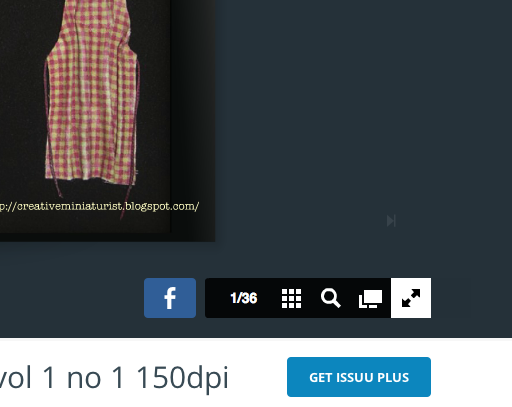 You can download the magazine by opening the page into full screen mode. At the top of the window will be a menu that appears when you hover over that area. 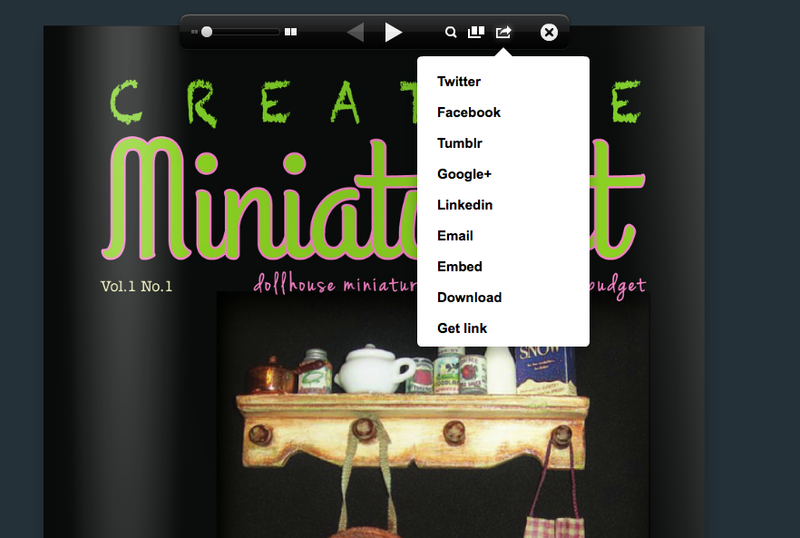 All the way to the right, choose the icon second to last and that is a drop down menu that has an option to download the magazine. The file will still be only 150 dpi, but legible on a computer screen. ISSUU does have a pay-to-print option ($6.15) at the bottom of the opening screen next to the "follow" button if you were so inclined. But as I said, the resolution is only 150 dpi, so it may not be that crisp. I will personally purchase a copy and let you know how it looks. Also, please note that all the links in the issue are live and clickable. Just hover over the url and/or word and the url will appear in blue. 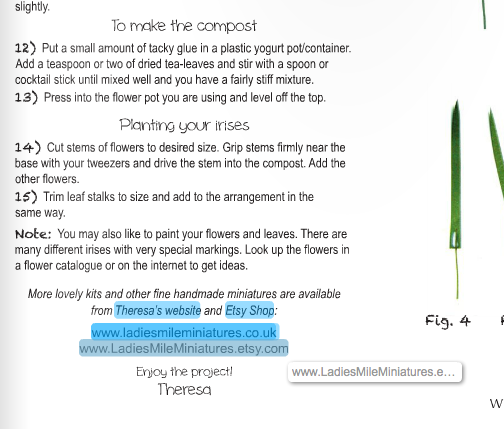 Please take the opportunity to visit the sites of the wonderful ladies who contribute their time and talents to making Creative Miniaturist© such a wonderful first edition! This doesnt workfor me. None of the photos on your blog are showing either. Susan, I fixed the photos on my blog easy enough. I has turned off a setting by mistake. What wasn't working for you specifically? Maybe I can help. There is no menu at the top of the page of the magazine when I open it. I can read but not download. Also, the printie photo on the side bar only comes up with internal error. I'm technically challenged so I'm probably doing something wrong. Are you opening the magazine to full size mode using the diagonal arrow at the bottom of the opening page. The magazine should fill your screen. That is when the menu at the top appears when you hover with your mouse. So sorry for the inconvenience this may be causing some of you! New One Inch Scale Artist Sets!